The European Union is an enigma, comprising a bewildering mix of legal, economic and political institutions and legislative bodies. Its complexity leads to a misunderstanding of its functions and a barrier to engagement. Almost two-thirds of Brits do not feel they are well informed about the EU. 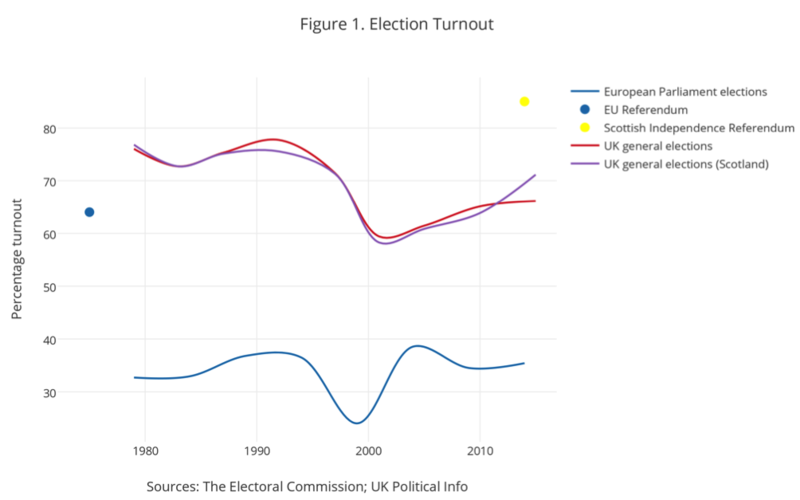 This translates to low voter turnout in European Parliament elections, as this chart shows. Alienation is natural. Newspapers and politicians spread misinformation and few of us are motivated to commit the time needed to understand the shapeshifting nuances of the EU – the treaty changes, the membership applications or the 1,700 pieces of legislation passed last year. But the EU is, of course, highly relevant. It governs our everyday actions: from how many hours we can work to the types of lightbulbs we can use. Freedom of movement means that around 500 million EU citizens can migrate to the UK. More philosophically, debates over our position within the EU revolve around some of the most profound issues of any modern democracy: the pros and cons of immigration (morally, socially and economically); the UK’s global economic position; and the democratic deficit that the EU might present. So we should engage. And now is the perfect time to do so. One of David Cameron’s key election pledges was a referendum on the UK’s membership of the EU. With a Conservative Government, the referendum will be held sometime before the end of 2017, which gives everyone time to get up to speed. David Cameron recently hosted European Commission President, Jean-Claude Juncker (L) at Chequers. In the run up to this referendum, much will be written on the key issues surrounding the EU, from all political positions. Whatever your preferred newspaper, magazine or blog, each will have something to say: how a referendum result would affect the cost of studying in Europe, your rights at work or even the position of expats. This expanding literature will give you a chance to follow and digest debates on your terms, on issues that affect you, providing every opportunity to engage in the EU. A referendum should also motivate the disengaged as it removes the evils ever present in other elections. All votes will count, unlike in our constituency-based general elections, where the value of one’s vote varies depending on how ‘safe’ the seat is. The EU referendum will also transcend party politics: the Tories will be split and the other main parties will join to campaign to vote to remain in the Union. Further engagement would also arise from an online voting system. WebRoots Democracy has persuasively shown that online voting could increase voter turnout by 9 million voters in a UK general election (and save millions of pounds). Using online voting for the referendum may be wishful thinking, but its installation would continue the trend of implementing technology during EU referendums: the 1975 referendum saw the first televised political debates. Furthermore, the recent Scottish independence referendum highlights the extent to which involvement in an issue can spark widespread engagement. On a similarly important constitutional issue of independence, the 2014 referendum saw a huge turnout of around 85 percent – much higher than any recent general election turnout in the country. Importantly, however, this translated into increased political dialogue: a study concluded that following the referendum, Scots were more likely than people in other parts of the UK to engage in political dialogue and activity. In addition, the 2015 general election turnout was a full five percent higher in Scotland than in the UK as a whole – the largest gap in the postwar period. This shows that political engagement can be created following a passionate and informed referendum debate, revolving around fundamental issues. Informed debate and a strong turnout will provide political energy and legitimacy for the EU referendum, no matter the result. These would be strong foundations upon which to improve engagement in a variety of political issues. Alex Hitchcock is a History graduate currently working for a think tank in Westminster.